Heroic Puebla de Zaragoza, or Puebla de los Angeles, is one of the cultural gems of Mexico. Located about 70 miles from Mexico City, Puebla contains more works of art than any other place in Mexico and the Americas and has been declared a World Heritage Site by UNESCO. 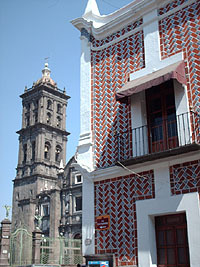 Puebla's Historic Center of the city, which was founded in the 16th century, reflects its rich and turbulent history. Although the downtown area showcases centuries of history, Puebla today is one of the Mexico's largest cities, (population almost 2 million) and a first-class industrial, commercial and tourism center. This rapidly growing, contemporary city, with its many big, modern buildings, as well as centuries-old haciendas, extends in all directions from the Historic Center. Surrounding it are numerous interesting attractions that make this destination one of the most fascinating in all of Mexico. There are numerous plazas, small parks, colonial homes, churches and small streets that make this a pedestrian friendly destination, with numerous cafes, restaurants and shops to found all around the main square. 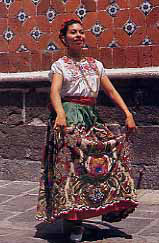 Despite the immense size of the city itself, in the historic center the traveler will find so much to enlighten and entertain within walking distance of the main square. . One important distinction that makes Puebla so unique are the many buildings and churches whose facades are completely or partially covered in the famous Spanish talavera tiles (see history of Puebla for more on talavera). 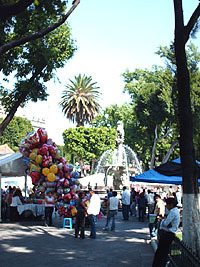 The zocalo, in the heart of the Centro Historico, is a pleasant place to pass an afternoon. Huge laurel and jacaranda trees shade the iron benches and frame the playful fountain. Many shops, hotels and restaurants surround the zocalo as well as the main cathedral of Puebla, the Cathedral of the Immaculate Conception. The church takes up one whole side of the zocalo. One of Mexico's largest churches, completed in 1649, the interior features 14 chapels, an onyx main altar, a beautiful wood inlay choir loft, and colonial religious art. Outside, the fence that surrounds the cathedral has angels all around, guarding the church. The State of Puebla, of which the city Puebla is capital, is located in the south central portion of the Mexican Republic, and has population of more than 4 million people. Because of its mountainous terrain, and high altitude (higher than 2000 meters (7,800 feet) above sea level) it is hot during the day and very cool, and sometimes very cold at night. Yearly temperatures averages are 70F for daytime and 51F at night. 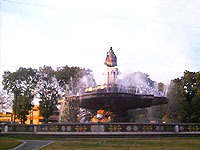 Puebla occupies an important position in Mexico's history, as the location for the Battle of Puebla where the local militia was able to defeat the French Army on May the 5th, 1862. This victory is the cause for today's Cinco de Mayo holiday, which is most enthusiastically celebrated in Puebla and the massive, stone forts of Loreto and Guadalupe that protected the city can still be seen and visited. Of other historic interest is the legend of the China Poblana, who is memorialized all over the city and has a large monument dedicated to her, close to the center of town. It will turn you into heaven. Whereas courtiers end up in Heaven. For other interesting and impressive attractions in Puebla: (see Activities section for full details).